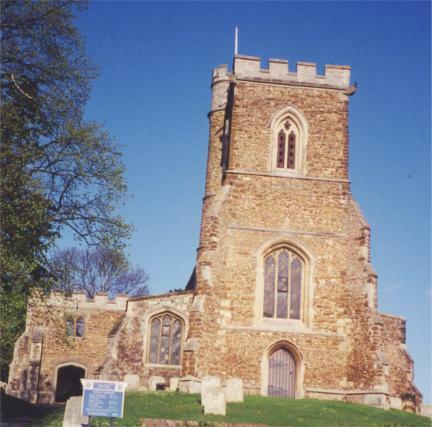 Potton History Society hosted the annual AGM and conference, this year, at the lovely St Mary’s Church and church hall situated on the Gamlingay side of the ancient market town. The sun shone on the 53 members from some of the 31 member societies as well as a major team of local society members working hard to make the day work smoothly. Chairman George Howe gave us all a warm welcome. Peter Ibbett, Programme Secretary and a founder member of this leading local group (founded 1977), gave an inspirational opening presentation on ‘The Challenge to 21st Century Local Historians’, looking back to those pioneers such as Betty Chambers, editing the Bedfordshire Magazine, after the Second World War and the growth of local history societies which began in the 1970s in particular. He emphasised that it was people and their sense of local affinity which motivated much of the diverse research into local history. He reminded us how much photographs from the past provoked local interest and that personal connections were so important. Local documents enabled us to ‘time travel’ and the exhibitions of these photos and documents inspired others to get involved in researching local history. Now, in a multi-digital era, the problem was often ‘seeing the wood for the trees’ and this was where local history groups could play their part. In a question and answer session with the Potton Society’s web master, Sean Hendry told of how he got involved in setting up and developing their web site into one with15 separate parts and a monthly update of material to be found in the ‘What’s New’ section, drawing people from around the county, the country and even internationally into revisiting the site. Content included a virtual tour of Potton and information on upcoming talks arranged by the Society as well as an extensive photographic archive (from over 7,000, all have also been digitised!) and write-ups on members’ research into a wide variety of topics. A lively discussion took place among those attending as to how to maximise effectiveness of local history archives and web site. This was followed by an opportunity to view a sample of the range of hard-copy material the Society had produced over the last few decades, with documents and photographs carefully indexed so as to make access to related material easy. Those who were most active and mobile were taken by Peter on a walking tour into and around the market square of the town where developments over the century, particularly the rise and fall of the market, and key people and buildings were highlighted. Others chose to stay in and around the ironstone church and its graveyard, both of which were full of interest. All then met up for a delicious buffet lunch, provided by local people, in the well-appointed church hall, where the rest of the conference took place. Pamela Birch of the County Record Office (BLARS: Bedfordshire and Luton Archives and Records Service, to give it its full name) discussed the county’s web scene as it related to local history. The key web sites shown or mentioned were those of BLARS (including its online public access catalogue:OPAC), Bedford Museum, Luton Museum and Bedfordshire Libraries. Local history society web sites also played their part. The OPAC catalogue currently gave references to 60% of the county archive’s holdings. Their Community Archives pages had started as resources for school but had developed into ones for adults as well, with the ambitious aim of covering every settlement in the historic Bedfordshire (including Luton), offering material on the local church, non-conformist chapels, education, interesting buildings, licensed premises and a general introduction, showing current photographs as well as related references. 69 communities, over the three local authorities, had so far been covered and completion planned by 2023. She also outlined another long-term project to transcribe the registers for Bedford County Gaol from 1801 onwards, with 30,000 entries currently on the web site. There were also plans for digitisation of such things as the 1925 rate evaluation maps but this was expensive and hard to get grants for. They were putting the Sandy Chrystal postcard collection online as it is being catalogued. School registers 1870 – 1914 were also a priority and BLARS hoped to apply for funding within a consortium bid from a number of record offices nationally. The problems of copyright were touched on as well as the need for the record office to derive income from copies of documents and photos, in the same way that libraries relied on fines and museums relied on shops or catering for income generation. Pamela outlined how societies and individual volunteers could help the archives with their work by: supporting their application for grants, volunteering a day a week, helping with research and telling other people about the resources and services which BLARS offers. Pamela announced that BLARS was now accepting their first deposits of digital oral history sound recordings, bringing them in line with other record offices. After a discussion on how the BLHA might co-ordinate or encourage local history web activity, George Howe and Peter Ibbett shared a ‘two Ronnies’ audio-visual presentation on local people and places, ‘They Walked Potton Streets’, which was lively, informative and entertaining. The atmosphere of the day was friendly, welcoming, inclusive and altogether uplifting. The friendly folk of Potton were mostly to thank for that but the sun and the glorious setting did help.